An international team of more than 100 researchers has published the first modern road map of insect evolution. Understanding how insects are related, which until now has remained largely unknown, uncovers their true ecological, economic, and medical importance. The results, appearing in a recent issue of Science, reconstruct the insect “tree of life” and answer longstanding questions about the origins and evolution of the most species rich group of organisms on Earth. The results, published by scientists from the 1KITE project, are essential to understanding the millions of living insect species that shape our terrestrial living space and both support and threaten our natural resources. More than 100 international scientists contributed to the landmark evolutionary study. 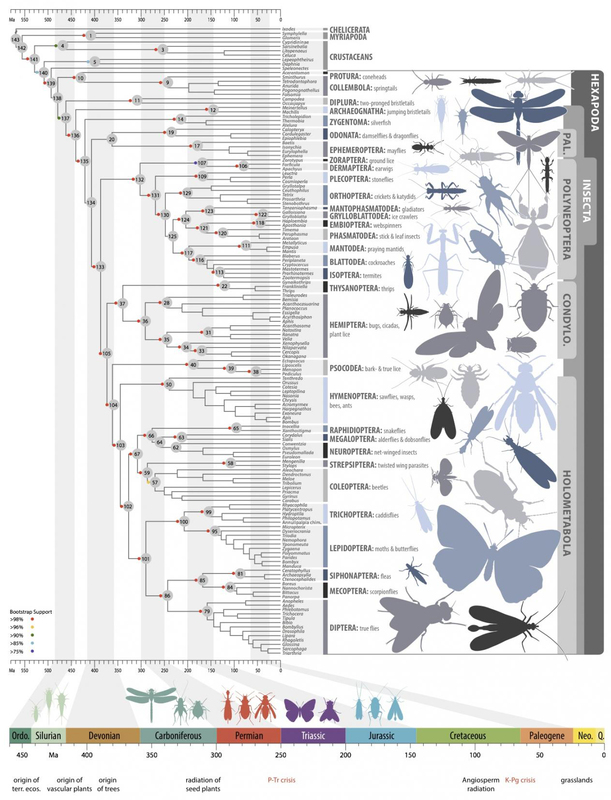 The enormous molecular dataset includes 144 carefully chosen insect species, and reconstructs the insect tree of life. Photo by 1KITE (1K Insect Transcriptome Evolution). Click here for larger photo. Using a dataset consisting of 144 carefully chosen species, 1KITE scientists have presented reliable estimates on the dates of origin and relationships of all major insect groups based on the enormous molecular dataset they collected. They have shown that insects originated at the same time as the earliest terrestrial plants, about 480 million years ago. Their analyses suggests that insects and plants shaped the earliest terrestrial ecosystems together, with insects developing wings to fly 400 million years ago, long before any other animal could do so, and at nearly the same time that land plants first grew substantially upwards to form forests. The new reconstruction of the insect tree of life was only possible by a cooperation of more than 100 experts in molecular biology, insect morphology, paleontology, insect taxonomy, evolution, embryology bioinformatics, and scientific computing. The consortium was led by Karl Kjer from Rutgers University, Xin Zhou from the China National GeneBank, and Bernhard Misof from the Zoological Research Museum Alexander Koenig in Germany.